Everything You Ever Wanted To Know About Plants, Part 7: When is a Berry a Berry? Welcome back to the Our City Forest Blog. Spring is here and California is becoming an even lovelier place as trees erupt into foliage and flowers and the rain subsides. Soon we’ll be enjoying stereotypically balmy, Mediterranean weather that the Bay is famous for. With spring and summer come farmers markets and a wide variety of fruits and vegetables. In the next two months, berries of a ton of different varieties come into season including, strawberries, raspberries, blackberries and blueberries. Well, I say berries but really only one of the berries mentioned is actually a berry. Guess which one? I’ll wait. As the narrator of a blog piece about botanical fruit varieties I have infinite time. The berries are waiting. By "A Healthier Michigan via a CC 2.0 license"
So what makes a berry a berry? How do botanists define fruit and distinguish between different types of fruit? From a botanical standpoint, a fruit is the ripened, fertilized ovary of a plant, containing seeds. Anything that contains seeds is a fruit which that means everything from eggplant to maple helicopters to wheat to tomatoes are fruits. Fruits are categorized by anatomy and what sort of flowers they derive from. All fruits derive from the pericarp, the wall of the ovary that surrounds the fertilized seeds. The pericarp is divided into three regions, the epicarp, the mesocarp and the endocarp, the outer, middle and innermost layers. Botanists examine these tissue layers in fruits as they develop to group fruits into classifications. Fruits are also broadly divided between “fleshy” (berries, drupes, pommes, peppos etc) and “dry” fruits (nuts, fibrous fruits, caryopsis etc). With all this in mind, here are some common fruit types and how to recognize them. Berries are fleshy fruits that develop from single, mono-ovary flowers. They typically have small seeds, that pass easily through the digestive system. They have soft or leathery epicarps, fleshy mesocarps and thin, skin-like endocarps. Under the botanical definition bananas, elderberries, gooseberries, grapes, persimmons, cucumbers, eggplants, kiwi, chili peppers and tomatoes are all berries. Berries, in an ongoing effort to confound and confuse, have two subtypes Citrus and Pepo. Pepos are berries with a hard, rind-like epicarp around the fleshy or stringy mesocarp and thin endocarp. The hard rind develops around the entire ovary, encasing all the fertilized seeds from any given flower. Pepos are mostly produced by the Curbita genus that includes all squashes. The wide variety of squashes comes from extensive human hybridization and cultivation of 5 domesticated species within the genus. Pepos also include melons,which means that your watermelon or cantaloupe giant, weird berries. Citrus or “hesperidium” are berries with a tough, oily rind. The epicarp is tough, leathery and full of oil glands. The mesocarp is actually the white layer between the oily glands and the juicy, citrus segments. The endocarp is composed of modified, succulent hairs that contain the “juice” of citrus fruit. They surround the air-filled pockets called “locules” where the fertilized seeds rest. These juicy hairs provide nourishment to the seeds as they develop. 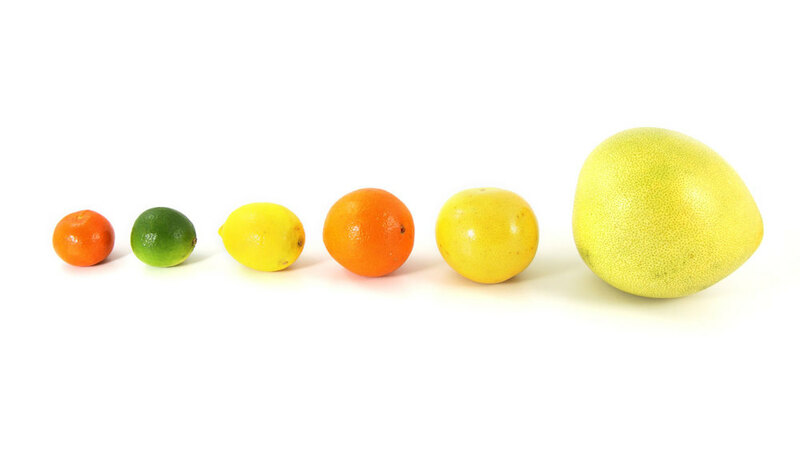 Citrus fruits can be traced back genetically to a single common ancestor, the descendants of which were extensively cross-pollinated by human intervention to create the commonly-consumed varieties we eat today. "I'm eating a giant berry!" My 5 year-old sister once yelled while eating a banana during snack time after I taught her how fruits worked. We got a confused call home. Citrus are berries too, weird berries called "hesperidia", Berries with a rind, albedo and "juicy engorged hairs". Kiwis aren't just birds or New Zealanders, they're also berries. The hairy skin is edible! Woo! That's right baby, squashes are just weird berries! Now you can make weird-berry soups and weird berry pies. Weird berries for everybody. The hottest berry around and one of the worst smoothie ingredients. Add to a fruit salad for an unpleasant surprise. 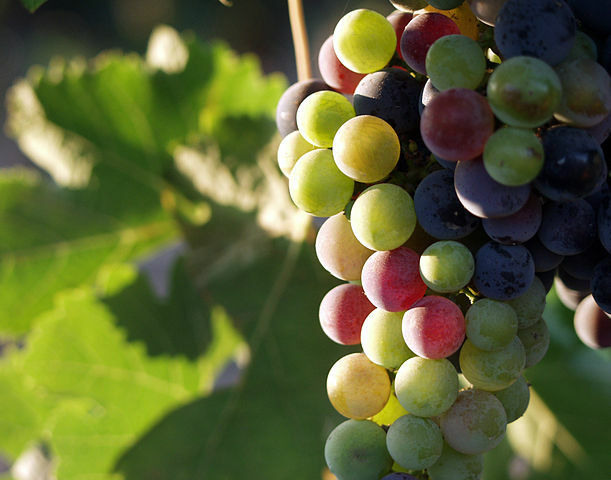 Grapes are berries you can ferment into delicious wine, or enjoy while reclined on a lounge surrounded by palm-fans and Doric columns. 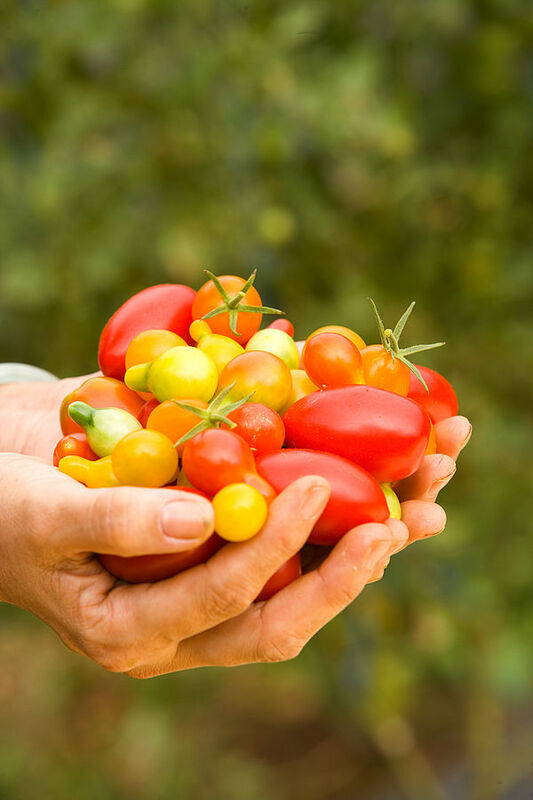 In spite of the Supreme Court, Congress and popular opinion, tomatoes are berries. Melons are berries. Yes that means watermelon. Eggplants are berries. They're also a nightshade and closely related to tobacco and tomatoes. Drupes are fleshy fruits where the epicarp and mesocarp surround a hardened, tough endocarp which protects the seed. The epicarp is either soft or leathery (or hairy in the case of peaches) and the mesocarp is fleshy, soft and juicy. Fruits like this typically develop from flowers with “single carpels”; carpels are the part of the flower that bear the ovary and receive pollen. Drupes are very common and include mangos, cherries, pears, olives, plums, and coffee “berries”. Plants that produce drupes often co-evolved with different animals for seed dispersal. The fleshy part of the fruit serves as an incentive for an animal to ingest the fruit, swallow the endocarp and seed. The seed, protected by the endocarp, passes harmlessly through the animal to sprout where ever it gets dropped. Mangos, cherries, plums, peaches, almonds and walnuts are drupes. Not all drupes are alike. Some drupes, like coconuts, have a fibrous dry mesocarp called a husk and hard endocarps. The part of a fibrous drupe that you consume is actually the endosperm, the nutritional layer that the developing plant embryo eats as it germinates. Coconuts didn’t co-evolve with some kind of massive, sea-dwelling fruit eater. The fibrous mesocarp acts as a protective, floatation device while the drupe travels ocean currents. Peaches in many ways are the "type case" for drupes with a fleshy, mesocarp, obvious, stony endocarp and thin epicarp. If you've ever had to sit down and pit individual cherries for a pie or tart you'll become very acquainted with their drupe nature. The best kinds of lassis are made with mango but best leave out the stony pit. 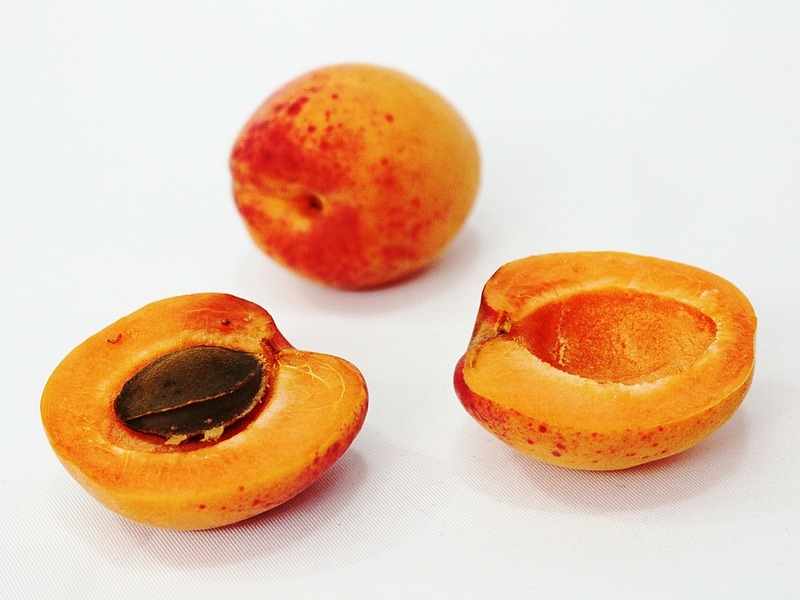 Like peaches, apricots are pretty obvious drupes. Unlike peaches, you can use the pits for sweetening things or making amaretto. It's a false nut that grows on a false tree. In many ways the coconut is the most duplicitous fruit. It's hard to see on a store-bought almond but the part you eat is actually the seed inside the hard endocarp. It's shelled for your convenience. Walnuts are drupes in the same way that coconuts are. The mesocarp is fibrous, like a coconut, but flakes off after the green epicarp is opened. Caryopses are simple, dry fruits. They are formed from a single carpel and do not open at maturity. The seeds of a caryopsis are fused with the pericarp which is so thin and hard that it does not have easily distinguishable fruit layers. Grains are typically caryopsis. Wheat, rice, corn, and barley are all caryopses. Fruits like these are intended to disperse and germinate relatively quickly. It shouldn’t be surprising that they are produced by grasses. Human grass crops have been selectively bred over the entire span of human history to grow gigantic caryopses to maximize crop yields. Your bread is made of ground-up freakishly large caryopses. Pomes are apples, pears, loquats, medlars and, locally, toyon fruit. They are a little strange compared to other types of fruit. 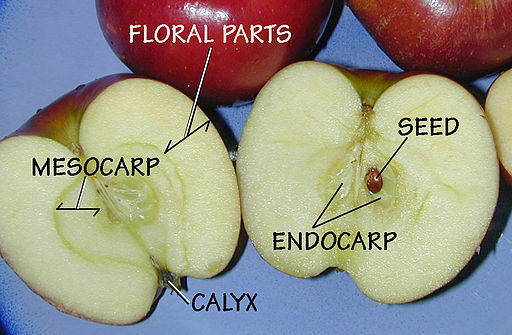 The endocarp produces a tough, stony case around the seeds, known as the core, The mesocarp and epicarp are fleshy and difficult to distinguish from one another. Most of the edible part of the fruit, including the skin, is derived from engorged floral tissue. You can actually see shriveled or reduced parts of the flower opposite the stem. This makes pomes a type of accessory fruit, a fruit where the flower-derived parts of the fruit outweigh parts derived from toe ovary. Not all pomes have a “mealy” or “crunchy” texture. Some pomes, like “chokeberries” are soft and have a barely-noticeable core. Here we can see the layers of the apple, labeled. The ovary forms the interior and the floral parts provide most of the edible flesh. 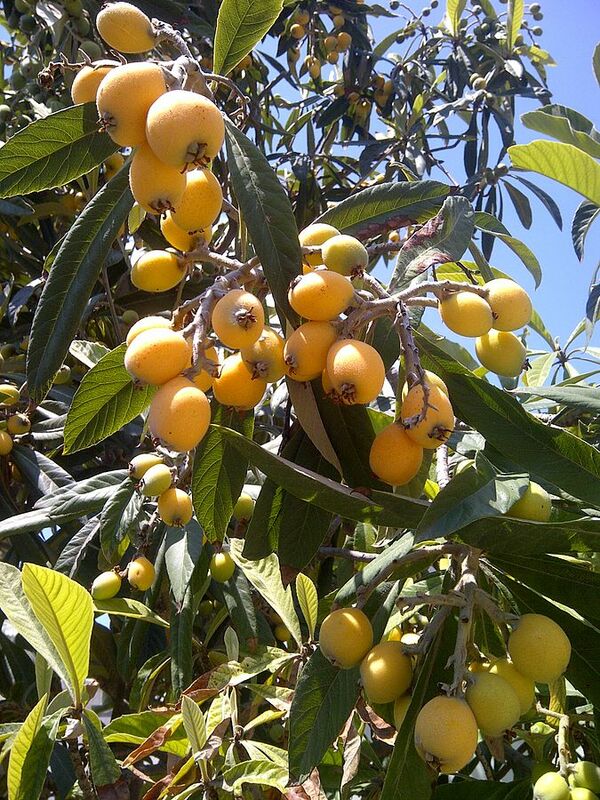 Loquats are delicious pomes from East Asia. You can have them as cider, as jam and fresh! Look for them at an Asian Food Market. Medlars can be found in southwest Asia and southeastern Europe along the coasts of the Black Sea. Medlar ripen in the winter and are initially bitter and hard. Once softened they can be turned into something that tastes like applesauce or turned into "medlar cheese"
I'm pretty sure you know pears. They're like apples and can be made into sauces, jams, cider and even simmered in red wine. Like medlars, quinces are usually bitter and difficult to eat raw. Once "frost ripened" they are sweet and easily turned into jams or wines. Marmalade is actually a quince jam. A local favorite of birds and small mammals, toyons are actually not berries; they're tiny pomes with tiny cores. Toyon are edible but bitter and require special preparation. We take no responsibility if you try them. Nuts are fruits that have a dry, hard, stony epicarp, mesocarp and endocarp at maturity. Typically, they contain only one seed.The pericarpal fruit layers are not attached to the seed, which remains loose within the developed ovary wall. Nuts are commonly produced by trees of the Fragacae order which includes oaks, beech, chestnuts, hazel and hornbeams. This can be confusing from a culinary perspective since “nut” in cuisine refers to any hard-shelled, oily-kernelled edible seed. Brazil nuts, walnuts, pecans, almonds and pistachios are not actually true nuts and actually fall into the “fibrous drupe” category, sorta like coconuts. Legumes are fruits that develop from a simple carpel that usually split open along a seam at maturity. The vast majority of legumes are dry fruits (chickpeas, peanuts) but they can produce fleshy fruits (snowpeas, sugar snap peas, green beans). The whole ovary of a legume develops into the dry or wet pod after pollination and fertilization. All legumes are from Fabaceae, a family of plants famous for their nitrogen fixation. Most things commonly-termed beans are legumes but some, like vanilla beans, are actually not legumes. Like Indian food? You've probably eaten savory tamarind in chutney, curry or rice. Tamarind sweetens over time and can be made into ice cream. A well-known false nut, the peanut is amazing salted and even better in peanut butter or stir fry. Their high-calorie content and protein make them excellent components in UN-sponsored anti-malnutrition efforts. By now, anybody reading this blog and I are like peas in a pod. Peas in the pod of fruit-based madness. You wanna eat peas porridge with me, dear reader? 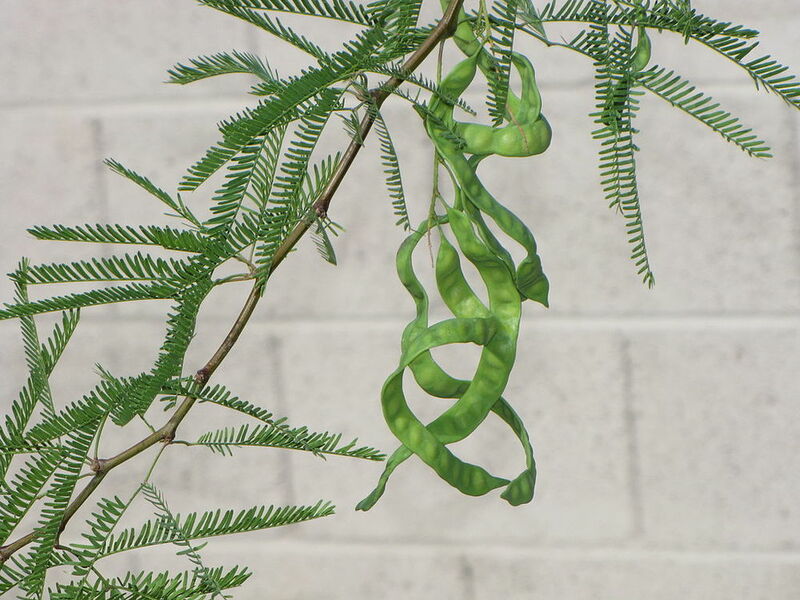 Mesquite isn't super edible when moist, but once dry the beans can be ground into meal for seasoning or to make tasty cakes and breads. Common beans, AKA kidney beans, black beans, white beans, "popping beans", and many others. Chances are, if you're eating a bean, you're eating one of these. Achenes are simple dry fruits that an endocarp, mesocarp and epicarp that aren’t easily distinguished. They do not open when ripe and the single seed takes up most of the space within the fruit. Achenes are sometimes mistaken for grains, especially in the case of buckwheat. The most commonly encountered achenes are the seeds on the exterior of the strawberry. As it turns out, strawberries aren’t berries. The “fruit” of the berry is the little seed on the outside of the red, sweet, engorged vegetable matter that tastes ever-so-good in smoothies. The stuff you actually eat (the achenes pass harmlessly through your body) isn’t part of the ovary of the flower, it’s actually part of the stem. The other achenes you might be familiar with are sunflower seeds or, if you’re feeling really frisky, the maple “helicopter”. Achenes with leafy wings, like the maple, are called “samara”. Aggregates are fruits that develop from several ovaries contained and fertilized separately within the same flower. They’re different from simple fruit because simple fruit arise from single, fertilized ovaries. You’ve probably eaten aggregates before in the form of raspberries or blackberries. Each bump on the raspberry or blackberry is a tiny drupe containing a single seed. Strawberries, in a continued effort to confuse fruit-loving members of the general public, are both aggregate and accessory fruit. Multiples arise from clusters of flowers around a central stem, an inflorescence. Each flower is pollinated and fertilizes its embryos individually. When the flowers of an inflorescence develop into fruit they ripen and merge. Think about the exterior of the pineapple. Each “cell” on the outside of a pineapple was once an individual flower, the “core” of the pineapple was the stem of the inflorescence. There are a couple other multiples too, figs, mulberries, osage-oranges and breadfruit are all multiples. Ok now breathe. That was a lot of information wasn’t it? Well brace yourself because there are even more fruit varieties. We didn’t even cover capsules, siliques, scizocarps, follicles, or utricles. Don't worry though, we're not going to inundate you with more fruit types. By now you're probably wondering why the common definition of fruit and the botanical definition are so far off. As it turns out.. Language and law ruin everything. In Old English there were two words for fruit. There’s “Apple” which indicated literally every sort of fruit or nut and “berry” which indicated any small, squishy fruit. Confusingly, Old English also had the word hnutu which meant “hard seed” and would eventually become the word “nut” by way of the Danish. The word “fruit” itself comes from the Latin fructus which was a word for any useful agricultural product or “delight and enjoyment” which later became the English word for vegetables, grains, nuts and acorns or “income from agricultural produce” (but only after it became the Old French world fruit, for “fruits eaten as desert or harvest”). Vegetable derives from a Latin term for “growing/flourishing” and only became the term for “green growing, non-animals” in the 15th century, displacing the Old English “wort”. Making matters worse, the word “vegetable” has no botanical meaning, further confusing the issue between scientists and the lay public. In other words, the reason that the common names of fruits are inaccurate is because the English language had only two native terms for fruit that were interrelated with similar words in neighboring languages. Over time, semantic drift made some of these words interchangeable, some of them distinct while at the same time new words were added to the lexicon. It gets even weirder when you layer legislation and culinary definitions on top of the semantic confusion. In Nix v. Hedden the Supreme Court heard oral arguments between tomato importers and the customs officials of the Port of New York. The customs office argued that tomatoes counted as vegetables for the purpose of taxation because people often referred to them as vegetables. The Supreme Court unanimously agreed, establishing a legal precedent favoring the common meaning of words when interpreting laws. In other words the Supreme Court found that tomatoes are fruits that can be legislated as vegetables because most people call them vegetables, unless the law applies to, say, botanists who distinguish between botanical fruits and everything else. So now you know why things are confusing and are armed with enough information to distinguish between different types of fruit, as a botanist would. You can impress your friends, annoy your teachers, and confuse your family members. The one thing you shouldn't do is get into fruit-oriented arguments with people. Nobody likes it when they're angrily lectured about the finer points of fruit anatomy and classification. It's even worse when you're a botanist, because there are some fruits, like avocados, that defy classification. Is it a berry? Is it a drupe? The only thing we're sure of is that the avocado is the fatty, Helen of Troy of the fruit world. Who knew fruits were so complicated?